Look sharp wearing this plus-size sequin formal dress for special occasions. 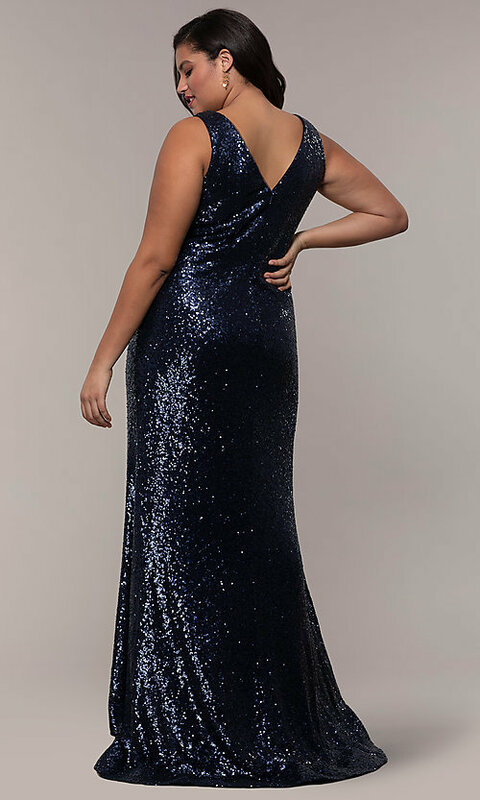 The plus-size long evening dress features a plunging v-neckline accented by an illusion inset and sultry high side slit on the full-length skirt. The princess-cut bodice flatters the figure, while a removable modesty panel allows for more or less coverage depending upon personal style. A v-back adds an alluring detail to mirror the v-neckline on the plus-size formal evening dress. The form-fitting skirt skims the hips to the floor where a horsehair hemline provides structure. Slip into this flattering plus long evening dress and shimmer from head to toe at a gala, military ball, or another formal event.